Many folks who are getting into or who are well into listening to old time radio are missing out on a whole other country’s worth of material . The UK, Britain, whatever you want to call it, is the home of so much great radio waiting to be heard. Some of it you may know of even if you do not know it. In this episode we dive into three different treasure troves of listening from that great isle. But Don’t Take Our Word For It….. 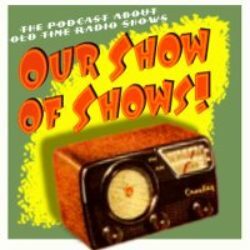 This is the home of Our Show Of Shows, a podcast about all things Old Time Radio.